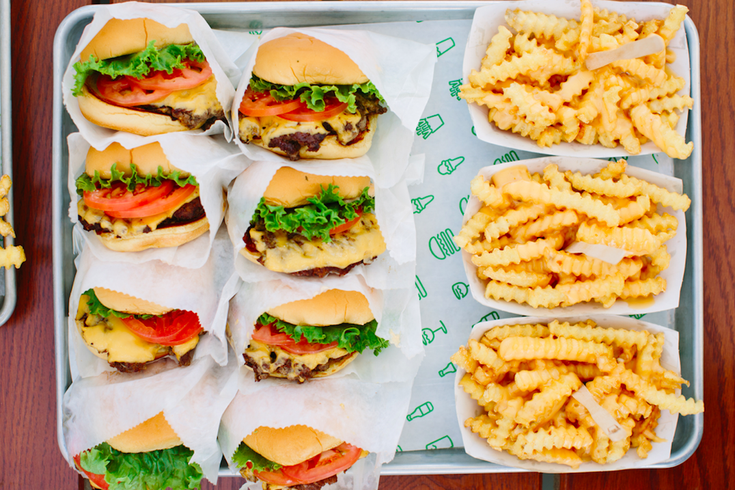 Burgers and fries from Shake Shack are pictured in the photo above. As a reward for making it to the end of 2018, go ahead and get yourself a free cheeseburger at Shack Shack. The fast-casual restaurant is running a promotion until Jan. 2 that will enable you to add a free cheeseburger to any order of at least $10 placed through the Shake Shack app or at order.shakeshack.com. Yes, you have to spend $10 to get the free burger, but that just means rounding out your meal, treating a friend, or splitting the cost of a bigger meal with a friend. Shake Shake has two locations in Center City, one in University City and one in South Philadelphia. The company is reportedly running a pilot delivery program at locations around the country to test out which carriers and menu items maintain their standard of quality. Whether it's your last burger of 2018 or your first of 2019, a free burger is there for the taking.